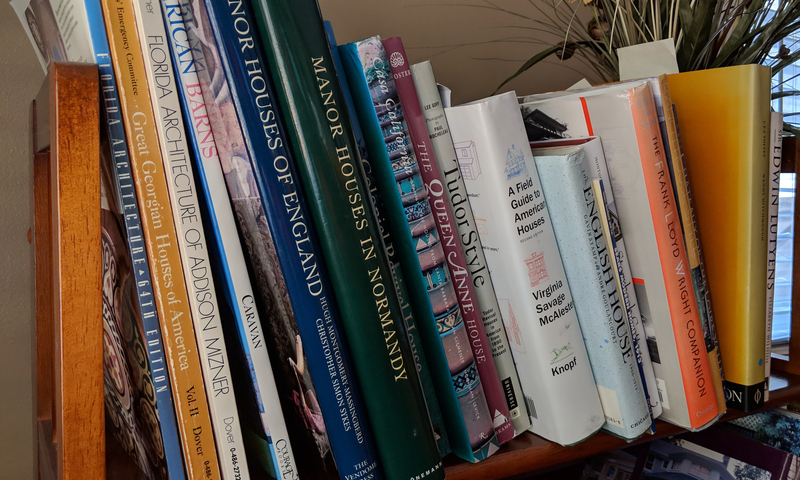 Inspiration is one of my most important keys for getting a home design project started, and I find lots of it in the architecture books on my bookshelves. I’ve built a solid library over the years and I use it almost every day. 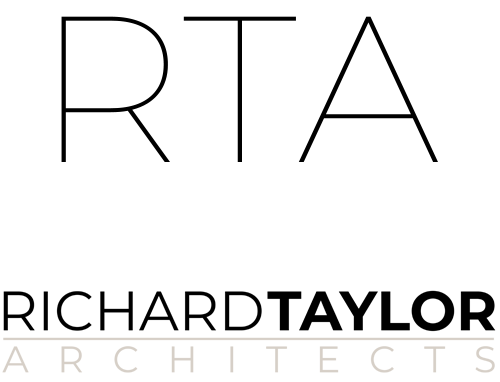 My book subjects include home design, history, urban planning, architecture styles, details and craftsmanship, and more than a few monographs. I find good books at a number of places including the shelves at discount bookstores (because good Architecture books aren’t cheap). Whenever I’m touring notable or historic locations, I head for the gift shop looking for hard-to-find design books. 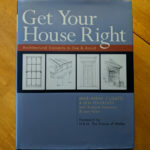 Amazon.com has also become a great place to find design books, but I shop there cautiously – more than once I’ve found myself having to pare down a two or three hundred dollar shopping cart. So why all these books? Some are for personal interest, and some are to learn more about some specific architectural issue. I use a lot of my books for inspiration on specific design projects. For example, when I’m starting a design that requires keeping with a certain architectural style, I like to begin by “priming” my brain with images of great examples of that style. That puts me in the right frame of mind for the project and helps make be a better designer. Note: this post includes affiliate links, which means if you buy a book through the link I’ll get a small commission – which helps keep this blog going. Thanks! If any book in an Architect’s library deserves the title of “bible”, this one’s it. 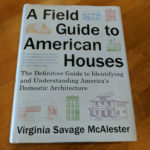 Virginia’s classic book is a complete history of houses, and shows in detail exactly how to figure out the style of any American home. IMHO, any book that contradicts “A Field Guide” is just…wrong. 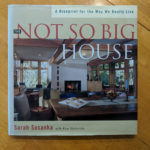 Ms. Susanka is an Architect formerly based in Minnesota, who left her successful practice when “The Not So Big House” became a fairly huge hit. TNSBH is a philosophy of home design that more people (and Architects) need to embrace. It’s not about small houses, or cheap houses – it’s about better living through good design. She followed up TNSBH with a series of companion books – all good reads once you’ve tackled the original. These are the houses I think of when someone says “Craftsman”, even though, as you’ll see in this book, every bungalow isn’t a Craftsman. 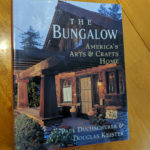 If that’s confusing, or if you just love these little American jewel box homes, get this book. “Colonial Revival” is the least understood architectural style in America, which is odd, because it’s by far the most pervasive. 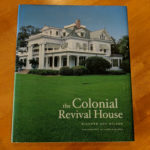 You’ve probably seen lots of Colonial Revivals, but thought they were “Victorians”, or “Georgians”, or something else. Noah sorts it all out for you with lots and lots of photos. A very nice collection of homes that fall broadly under the definition “farmhouse” – including traditional and very contemporary examples. 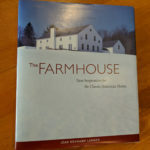 The author includes a lot of details of farmhouse interiors. A good “inspiration” book when I’m working in this style. One of my favorite books of all time – Marianne shows the proper way to use proportion, scale, and appropriate details to make a traditional home design look just right. She answers the question of why one house looks great, and another looks somehow…off. When I studied architecture, this stuff was still taught – not so much anymore, so it’s great to see someone who cares so much about “getting it right”. And any book with a forward by Prince Charles is worth a look. 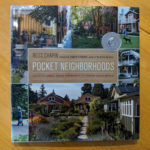 Ross works up in the San Juan Islands of Washington state, and has revived the idea of the pocket neighborhood with great success. If you appreciate smaller homes and close-knit communities you’ll love what Ross is doing. 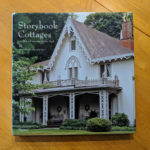 There are a lot of cottages out there called “storybook”, but the ones in this book are examples of the “carpenter gothic” style. Carpenter gothic is the other end of the scale from the high-style gothic homes you remember from scary movies – these homes are super cute, and full of great design ideas. Not everyone likes Tudor style, but I do – I like it for a lot of reasons including the fact that no two Tudor homes are alike. 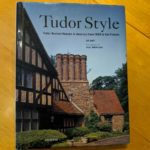 This excellent book traces the development of Tudor style in the United States and is packed with great photos. 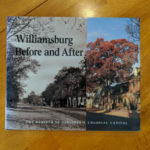 The last book on this list is for the history junkie, or for the regular person who thinks Williamsburg has always been the way it is today. Not so much – it was quite a mess when the Rockefellers decided to save it and make it into the American treasure it is today. These restored homes are the root of all traditional design in America today. Contact me to learn more about the services I offer and how I can help make your new home or remodeling project exciting, valuable and unique. Great List! I have several of these in my collection but want to add the rest!